No trip to the Outer Banks is complete without cruising through Brew Thru, the Outer Banks’ original drive thru convenience store. Whether you’re looking for a refreshing cold beverage of Coke, Pepsi and other soft drinks on the go, stocking up your cooler with refreshments to enjoy at the beach or piling up on beer and wine for a party, Brew Thru is a fun and unique experience all vacationers need to see for themselves. 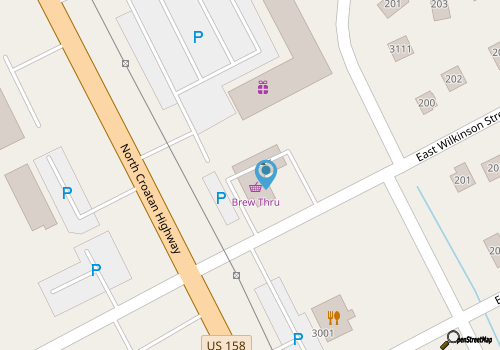 Brew Thru is your quick and easy stop for stocking up on over 120 varieties of beer, including kegs, as well as family snacks and drinks for the beach. Kegs are available in 1/2 and 1/4. Many beers are availabe in kegs on hand, and you can place a special order for additional variety of brands. On hand keg brands include Budweiser, Busch, Coors, Fat Tire, Killians, Keystone, Michelob, Miller, Natural Light, PBR and Yeungling. Special orders include Bass Ale, Blue Moon, Dos Equis, Fosters, Guiness, Harp, Heineken, Kona, Magic Hat, New Castle, Sam Adams, Smithwicks, Stella Artois and St. Georges. A variety of wines also are available. Brew-Thru souvenir t-shirts are an absolute must have! Since 1977, at the time of this publication, Brew Thru has sold over 4.5 million t-shirts. Apparal, collectibles and hats are available and the station attendant can give you a catalog to browse. The friendly station attendants serve you as you place an order from your car. Consider tipping for their service. Call 252-441-9190 for current hours.